Aqualyx® is a hydrous, micro gelatinous solution containing the active substance deoxycholic acid (a secondary bile acid). It comes in a water solution that destroys fat cells it comes into contact with. The treatment involves injecting Aqualyx® into fatty areas of the body with a syringe and cannula, under local anaesthetic, and the whole procedure should take no longer than 30 minutes. This depends upon how much fat is present in the areas that need treating. Upon assessment some people can get results with one session to remove a double chin, yet abdominal areas can take 2 – 4 sessions. Each patient needs an individual assessment to determine how many treatment sessions will be required for each area. In most cases it is 6-8 weeks between treatment sessions. This can be more or less depending on the areas being treated. Aqualyx® is injected into areas with fat needing lipolysis, and it finds the fat cells specifically, docks onto them and then causes the building blocks of that fat cells to separate from one another. These triglycerides and free fatty acids are then removed by the body’s own macrophages and are eliminated through the lymphatic system. The fat cells that have been destroyed will not come back, but patients would need to maintain or lose, rather than gain weight between treatment sessions for maximum effect. 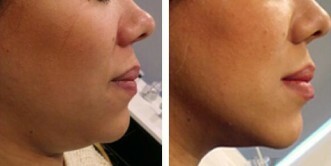 Smaller areas like the chin and neck, cheeks or upper arms cost £395. Larger areas such as the abdomen, buttocks or thighs are £450. Please check our price list for our up to date prices.